This gluten free syrup can be used in place of sugar, honey, corn syrup, maple syrup or molasses. 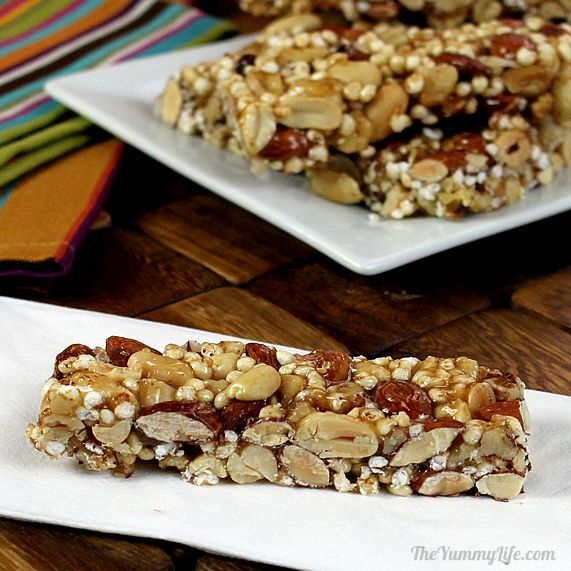 It is used along with honey to sweeten these nut bars. This inexpensive, stainless steel tool is easy to read and dishwasher safe. It takes the guess work out of cooking the syrup for these bars, and is also great for candy, jellies, and deep fried foods. This is 100% millet without a single other ingredient. It's a healthy, gluten free grain that gives a nutrition boost to these bars. This is preferred over whole flaxseed for better nutrient absorption. This OXO silicone spatula is heat resistant to 600 degrees. That makes it a handy multi-tasker to use for stirring the hot stove-top syrup and for mixing the nut mixture. This sturdy multi-purpose tool gets lots of use in my kitchen. It makes easy work of cutting these bars evenly. These are my go-to baking sheets. I use the large one for toasting the nuts. The small one is the perfect size for a batch of bars. Love the lids, too. Attach this to the side of a pot to hold a spoon or spatula. No more messes on the stove top! I use this clever gizmo every day. These 12 oz. bottles are handy for drizzling melted chocolate on the bars. This wildflower honey is pure and delicious. For other organic honey options, click below. Get all of the flavor and protein of peanut butter with 85% less fat. I used it in the Peanut Butter Dark Chocolate bars. This unsweetened coconut is pure and unsulfured. It's used in the Almond Coconut bars and Apricot Almond bars. Click below for organic coconut flakes. I used this handy gadget to chop the dried fruit for the bars. It's great for lots of small chopping jobs. 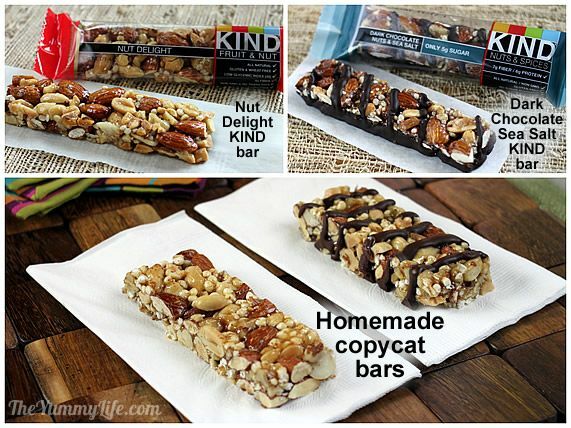 Are you a fan of KIND bars like me? They are by far my favorite non-homemade treat. Lucky for me, they're made with wholesome ingredients and are highly rated on many lists of nutritional bars. I'll take these over a candy bar any day. However, they are pricey, which led me to do some experimenting to figure out how to make a homemade version of these popular bars. After considerable trial and error, I think I've hit on authentic tasting copycats of the real thing. 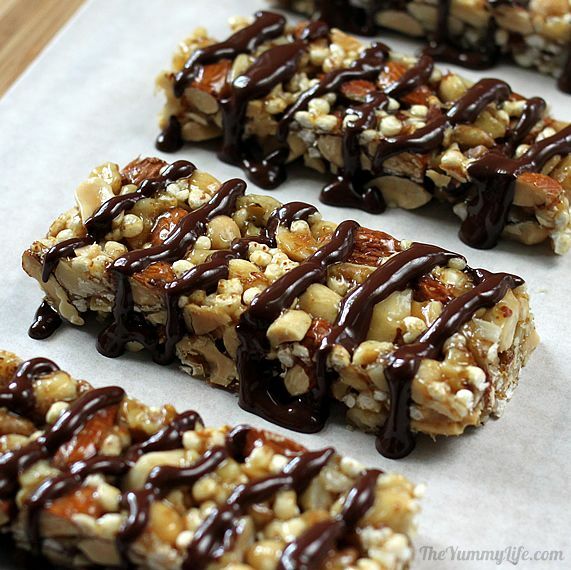 This post is long, because I'm sharing 8 recipes for the most popular KIND bars. So, keep scrolling if there's one in particular you're looking for. If your favorite didn't make the list, chances are you'll be able to figure out how to modify my recipes with different ingredients. They all follow the same basic formula. Healthy or not? I suppose you could debate whether or not KIND bars are nutritional bars, or energy bars, or protein bars, or healthified candy bars. I think they're all of the above. They are loaded with healthy, high-protein, high energy, gluten free ingredients. Although they're sweetened primarily with honey (along with a bit of corn syrup) and contain zero processed white sugar, they're sweetened nonetheless. So, KIND bars are still something that I consider a splurge, but a WAY healthier splurge than any candy bar and most other nutrition bars. 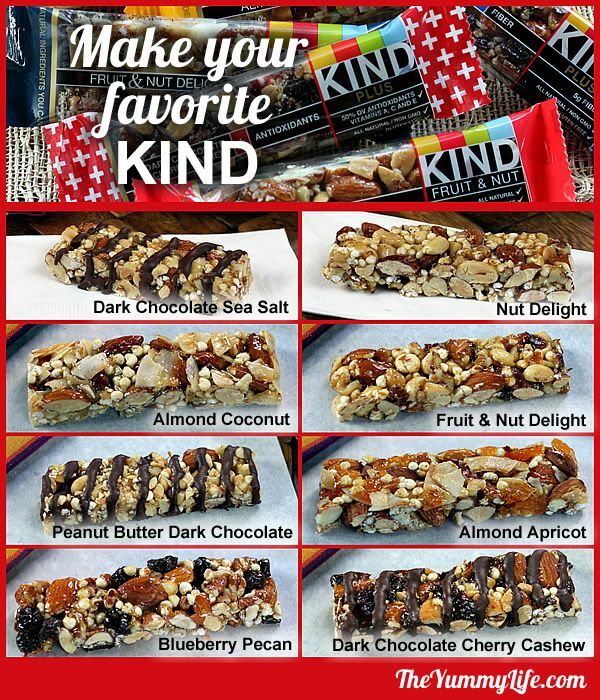 KIND bars recently got the #1 rating from Backpacker magazine for the best nutritional bars to take along hiking. Nutritional Data for 1 copycat bar (listed in order from least to most calories); all but 1 under 200 calories! Vegan? No problem. Omit the honey and use all brown rice syrup. Use vegan chocolate chips for the drizzles. BIG SAVINGS! 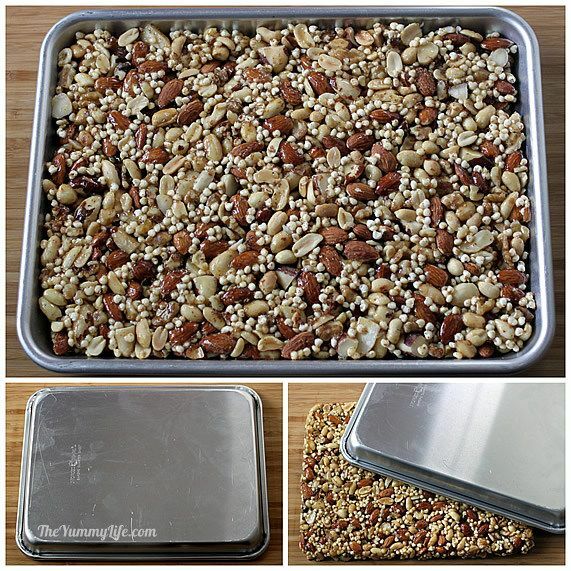 Perhaps the most exciting part of making your own KIND bar copycats is the money you'll save. They can be expensive to buy. I buy the ingredients for my homemade version at Trader Joe's and on Amazon. (You may also purchase KIND bars from Amazon. Replicating the recipe. It took quite a few batches to get the recipe right. The ingredients are simple, but figuring out how to cook the bars so that they had the right consistency took some experimenting. I tried baking them, but most of the honey syrup ended up on the bottom of the bars. So, although it added a step, I turned to cooking the honey syrup on the stove top. I wanted the finished bars to be firm enough to hold together yet not so brittle that they couldn't be cut easily. 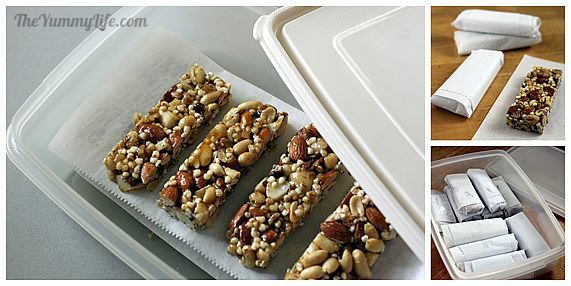 The texture of KIND bars is part of their appeal, crunchy nuts with a slightly chewy texture; a little bit sticky, but not too goopy to cut, hold their shape, and store for later. 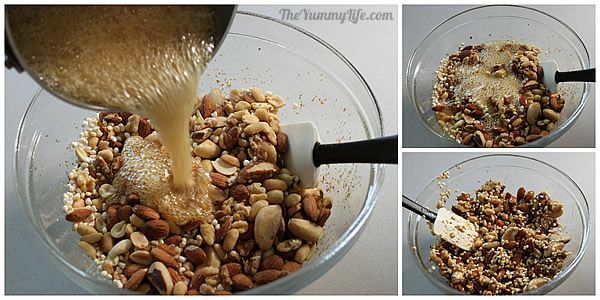 The key to the texture is cooking the honey syrup to the right temperature before mixing it into the nut mixture. First, I'll show you the procedure for making the basic mix and cutting the bars. (All 8 bar recipes follow the same basic formula.) Then, I'll share ingredients and tips for the 8 specific bar recipes. Step 1. Assemble the nut/fruit mix ingredients. Each of the 8 bar recipes include some combination of these ingredients. other nuts -- these vary from bar to bar; you may substitute other nuts of your choice as long as you keep the total volume the same. Whatever nut combination you use, some of the nuts should be chopped, because the smaller nut pieces help bind the mixture together. puffed millet, rice or other whole grain -- used in all 8 bars. KIND bars contain "crisp rice" in their ingredient list; however their rice pieces are tiny balls. 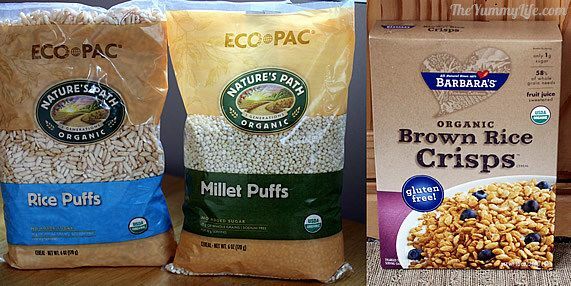 I couldn't figure out how to replicate that, and found the puffed millet to be the closest & easiest option. The puffed grains aren't crispy, but they add lightness to the bar texture. If you prefer something crunchy, you could use a crispy brown rice cereal (similar to Rice Krispies) like the one picture below. I purchased all of these at Whole Foods. They are also available in larger quantities on Amazon. Step 2. Toast the nuts (if you didn't buy them already roasted). 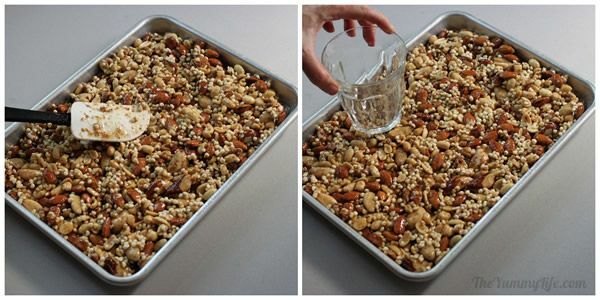 Spread the nuts in a single layer on a large baking sheet. Toast them in the oven for about 10 minutes until they are fragrant and lightly toasted. Step 4. 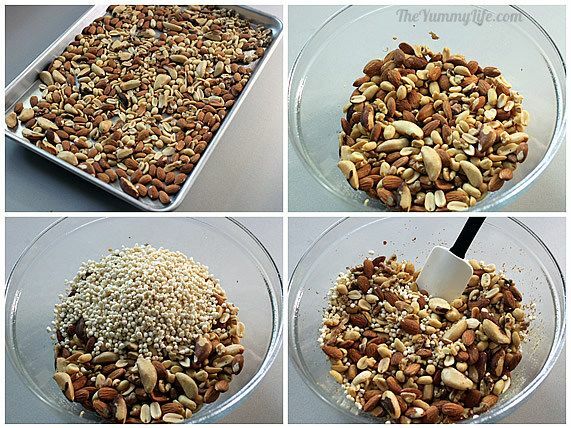 Add the toasted nuts, puffed millet, flaxseed, and dried fruit (if using) to the large bowl. Stir to combine. Set aside. brown rice syrup--it has a nutty flavor. Substitute light corn syrup for a more neutral flavor. frozen apple juice concentrate (pictured later)--this is only added to the syrup for the bars that have dried fruit to enhance the fruit flavor; I'll identify which recipes need the apple juice further down in the post. Step 2. 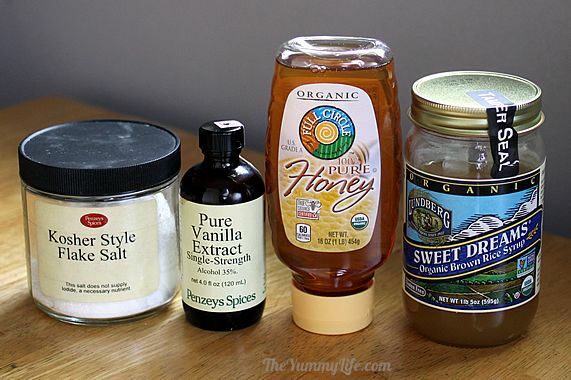 Combine the honey, brown rice syrup, vanilla, and salt in a 1-1/2 or 2 quart saucepan. 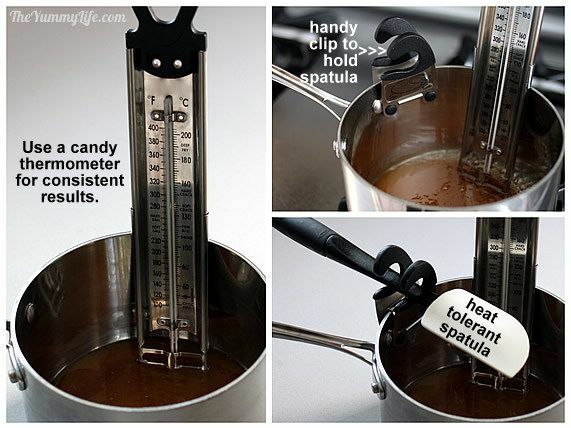 Insert a candy thermometer into the mixture. I used a heat tolerant spatula for stirring; it does a great job of evenly scraping the bottom of the pan as you stir the mixture. A wooden spoon is another option. If you're shopping for a candy thermometer, I highly recommended mine. It's durable stainless steel, easy to read, and dishwasher safe. I far prefer it over the traditional, tube-shaped one that I used to have (that one was more fragile, had to be hand washed, and eventually broke). Step 3. Over medium-high heat, cook mixture until it reaches 260 degrees--this is the "hard ball" reading on the candy thermometer (takes approx. 6-8 minutes). Stir it frequently; the mixture will foam up as it cooks. Watch it constantly once it reaches 240 degrees, because the heat rises very quickly after that and will hit 260 faster than you might expect. Step 4. Immediately pour the hot syrup into the nut mixture. Stir quickly and thoroughly, scraping from the bottom, until everything is evenly coated and mixed. Step 5. Quickly transfer the hot mixture to the sprayed/greased 9x13 pan. It cools and thickens fast. Spread it evenly in the pan. It's easiest to do this with your hands; spread and press the mixture to close in gaps and distribute evenly all over the pan. Use the bottom of a greased/sprayed drinking glass to flatten the mixture further; use a tapping motion to pack it down compactly. Step 6. Cool the bars in the pan approx. 20 minutes. (They are easier to cut when they are still slightly warm and haven't completely hardened.) Flip the pan over and tap it to release the mixture in one big piece. Several of the bar flavors are topped with dark chocolate drizzles. If you're a chocolate fan, feel free to add chocolate drizzles to all of the bars. 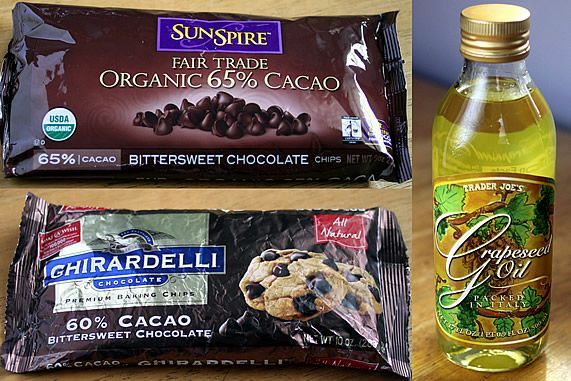 dark chocolate chips -- look for chips that are 60-70% cacao. 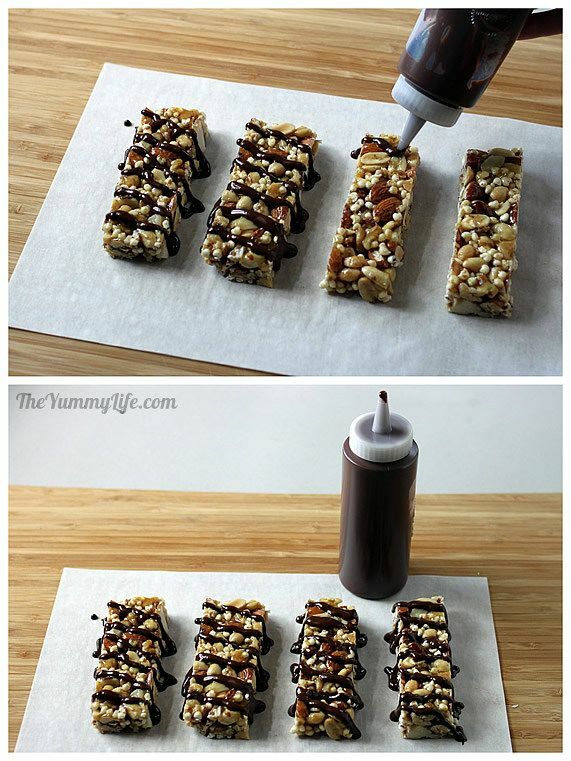 You can also chop a bar of dark chocolate into small pieces. Step 2. Melt the chocolate chips and oil. Add chocolate chips and oil to a microwave safe bowl. Cook on high power in 20 second intervals, stirring at each stop, just until last chips melt into mixture. 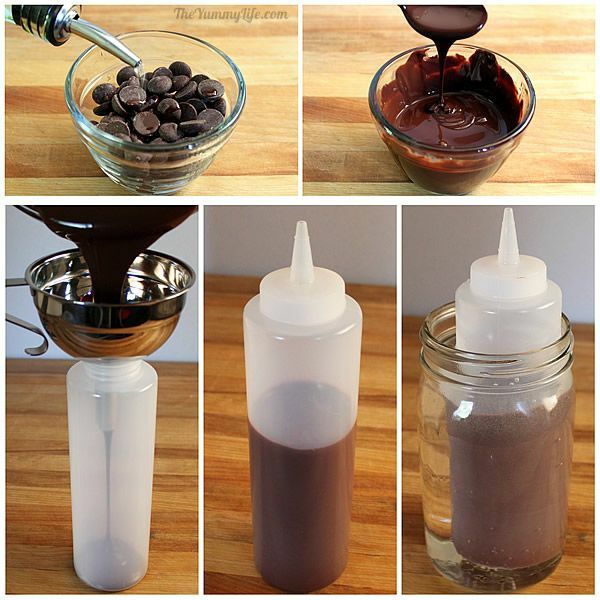 Add melted chocolate to a squeeze bottle; insert bottle in a jar of hot water to maintain melted consistency if you aren't using it immediately. Alternatively, you can add melted chocolate to a ziptop plastic bag, snip the corner with scissors, and squeeze chocolate through hole. Step 3. Drizzle the chocolate. 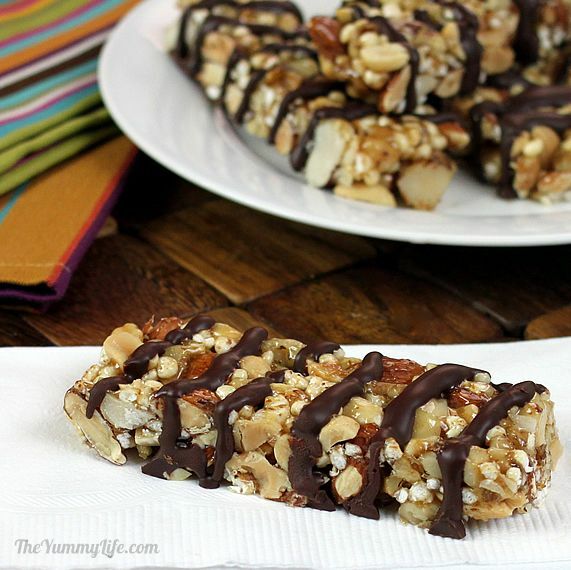 If you want to mimic the pattern on KIND bars, apply the chocolate in diagonal stripes. Although KIND bars also have a coating of chocolate on the bottom of each bar, I find the top drizzles to be enough, and you can easily add more drizzles on top if you want more chocolate. However, if you want yours to have chocolate bottoms, it's easy to do. Before adding the drizzles on top, melt additional chocolate chips and dip the bottoms of each bar in the melted chocolate. Rest the bars on parchment paper and add drizzles on top. Let set until hardened, then gently peel the bars off of the parchment paper. If you want the chocolate to harden more quickly, you can move the bars to the fridge after they've set at room temperature for a half hour. (Don't move them to the fridge right way; extreme/quick changes in temperature can cause the chocolate to bloom and get a powdery white film.) Once the chocolate has hardened, you can transfer the bars to an airtight container. STORAGE TIPS. Stack the bars in an airtight container with parchment paper between the layers to prevent sticking. 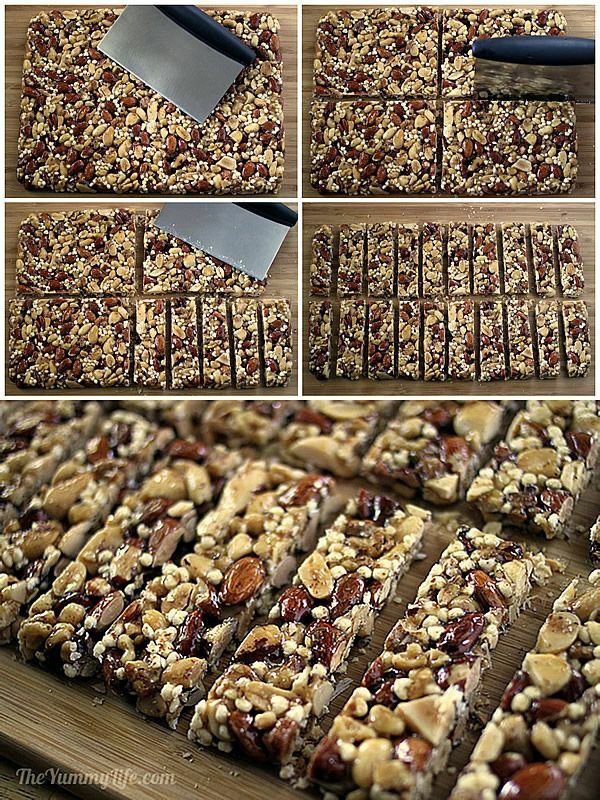 Or, wrap each bar individually in parchment paper before putting them in the container. The wrapped bars are convenient if you want to grab one to take with you when you leave home. Store at room temperature for up to 1 week. I prefer to refrigerate mine to extend storage even longer. Refrigerating the bars also keeps them firmer and less sticky bars. The bars may be frozen, too. This recipe adds some thawed frozen apple juice concentrate to the honey syrup to enhance the fruit flavor of the bar. The dried fruits needs to be diced fairly small so they get distributed throughout the bars. I used a mini food processor, but you may also dice them by hand using a knife. I first tried making these bars using regular peanut butter, but couldn't get the consistency right using my basic honey syrup recipe. PB2 worked perfectly though. What is PB2? It's a powdered peanut butter. It's simply peanut butter with 85% of the fat removed. With all of the flavor and protein of regular peanut butter, PB2 is recommended as a great way to reduce calories in all of your favorite peanut butter recipes. It's available at some Whole Foods and health food stores, and on Amazon. My grocery store recently started carrying it, too. This recipe adds thawed frozen apple juice concentrate to the honey syrup to enhance the fruit flavor of the bar. The dried apricots may be chopped by hand or with a mini food processor. This recipe adds some thawed frozen apple juice concentrate to the honey syrup to enhance the fruit flavor of the bar. Now comes the hard part--choosing a favorite! 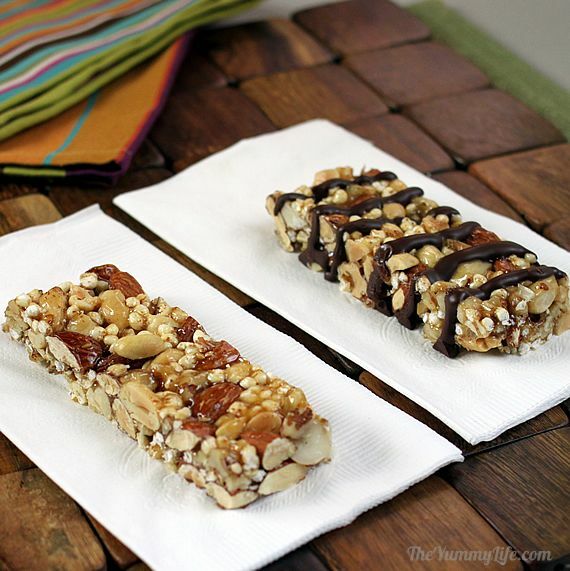 You can't go wrong with the basic Nut Delight bars. Which do you prefer--with our without chocolate? I'm for chocolate all the way!